As the world gets farther into the 21st century, the technology available becomes more a part of our everyday lives. It is now being integrated into our vehicles, as if distracted driving weren’t already a problem. Although it might be tempting to have the latest smart-car technology, drivers would be better off hitting the road the old-fashioned way. Motor vehicle companies are always looking for that leg up on their competitors, and that leg up always changes with each wave of consumer desires. Now it has become the ability for people’s cars to be just a technology savvy as the rest of their life. Apple is one of the technologies companies that will be offering an in car system that will mimic the abilities of an iPhone inside of a car. Apple’s CarPlay is being marketed as a way for easier and safer use of your iPhone while driving. 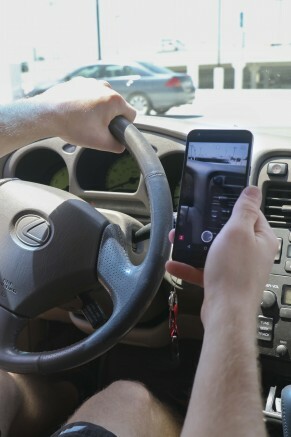 However driving laws have made it illegal to use a cell phone for virtually any reason because of the amount of distraction they cause to drivers, so there should be no difference in those laws even while using a system like CarPlay as it would be causing the same amount of distraction to drivers as using a cell phone. This system is hands free and reads out your texts and allows you to respond verbally but, AAA Exchange has found that hands-free driving is no safer than driving with a phone in a person’s hand. “What we have learned is that some of these voice based technologies are putting demands on the brain to try and multitask in ways that exceed the capacity to be able to do that activity and drive safely,” said cognitive neuroscientist David Strayer from the University of Utah. The amount of mental distraction from receiving, thinking about your response and then saying it is enough to pull a person’s mind out of the act of driving that could cause them to make a mistake or possibly cause a serious accident. Strayer and his team at the University of Utah have been doing mental exercises using virtual driving simulators and electroencephalography (EEG) skull caps, that read data given off by the brain and other methods to conduct research that has found that the use of cellular devices while driving can be dangerous. Some automakers and tech companies have come up with an idea for getting around the human element of driving with autonomous cars, freeing up would be driver’s hands to do things like take selfies. Although that still isn’t the answer to the issue. In the March 2016 issue of Car and Driver magazine, one article states the negative impact autonomy would have on businesses related to vehicles. When it came to job loss in the United States “some 200,000 taxi drivers and 3.4 million truck drivers will be at risk,” according to the article. The government would see less income from parking violations and traffic citations, insurance industries would lose a massive amount of money because of the safety of autonomous cars and countless other effects. Driving used to be seen as a way of freedom from the monotony of life, but with the ever growing hold that technology has on people that freedom is no more, as the stresses of life invades our one last place of sanctuary and creates more danger for ourselves and others around us. Be the first to comment on "Opinion: Technology is driving us into danger"